Statements like these are examples of what we might call “deliberative language”—language that allows people to identify key concerns, realize what is valuable to them, and weigh the trade-offs in possible courses of action—being used in everyday life. Unlike what happens in a more formal public forum, deliberative conversations aren’t a discreet event—they’re more like the rainfall in a given area: a little bit here, a little bit there, sometimes a great big thunderstorm, but over a year, the ground gets watered and the crops grow. These deliberations are often fragmented, episodic, unstructured, and involve different actors at different times—but over time, connections are made and progress can be tracked. This is the hypothesis underlying Kettering’s new line of inquiry into “organic” deliberative decision making. Deliberative decision making is a practice, not a technique; one that is as old as the idea of community itself. Communities are making sound, collective decisions together on wicked problems and this can be documented. For each wicked problem addressed by a community, at some point naming, framing, and choice making (deliberative or not), as well as perhaps other communicative practices occur. to what degree any of these communication practices accomplish the same function as deliberative naming, framing, and choice making. We hypothesize that at least some of the communication practices will reveal speech acts that accomplish the same functions as deliberative naming, framing, and choice making. Our long-term hypothesis is that, if such “moves” can be identified, documented, and shared, a citizen who is conscious of these moves could use them to move a group into a more productive, i.e. deliberative, way of addressing a wicked problem. Many of the most pressing problems that communities face require community members to make sound public decisions together. 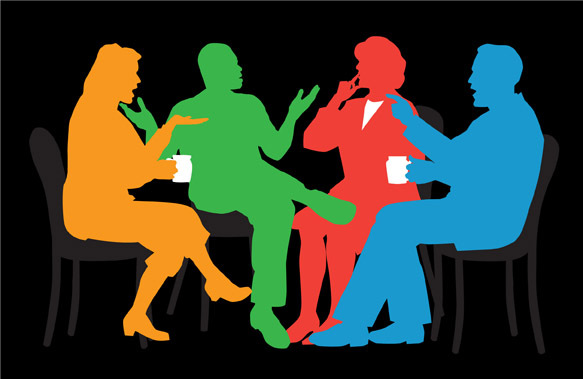 People talk every day, and some elements of deliberative decision making occur in these conversations, although they may not be recognized as such and could be improved. The Kettering Foundation has partnered with a team of researchers, representing seven states, who are studying community conversations in seven different locations to learn more about “everyday deliberation.” The research team is examining situations in which citizens are trying to address a wicked problem to see what communication practices are used by the community while dealing with that problem. Thanks to linguist Ekaterina Lukianova, currently a post-doctoral fellow at the Kettering Foundation, we know a fair bit about how the public talks together in organized deliberative forums. And many scholars have studied the structured group settings, which are intentionally designed to create a public discourse that is likely to result in a decision that people can live with. These spaces encourage participants to name problems in light of what is most important to them, to consider trade-offs and consequences of possible courses of action, and to find ways to work together and move forward with other participants. But we also know that not every community is organizing these structured public meetings, and yet these communities seem to be able to work together to make collective decisions. While individuals might not agree on every detail, communities as a whole have worked through difficult public problems and come to decisions about how to address them. These decisions are often provisional, but the decisions have at least temporary public legitimacy. Our research team is exploring what people do outside of those structured spaces that might help communities come to some kind of collective agreement on a course of action. We are looking for “everyday deliberation”—the kinds of conversations that are happening at PTA meetings, around kitchen tables, and over backyard fences. Ultimately, our goal is to learn more about the communication practices in everyday life that help people and communities move toward a sound public judgment and about the communication practices that inhibit or block that movement. weighing the trade-offs of a course of action against those things held valuable and trying to come to a course of action everyone can live with. We’re listening closely for the questions people ask, the comments they make, and the shifts in conversation to a more deliberative mode. We’re also examining how existing relationships and other contextual factors influence how people come to judgment over time. Consider the conversation in the flow chart (click on thumbnail to enlarge). This hypothetical conversation is based on real conversations that members of our team both heard and participated in following the tragedy at Sandy Hook Elementary School. The diagram imagines a discussion between four friends at a local coffee shop. In this conversation, we believe we have examples of people naming problems and framing options in a deliberative way. Look at how inseparable the naming, framing, and weighing of trade-offs are in this conversation—to say nothing of public life as a whole! The conversation explores various ideas about what a public response to the tragic shootings might include: Is it an issue of gun control? An issue of mental health care? A combination of the two? to do something about is mental health in this country. No sooner had one option been proposed (framing) than people begin to surface disadvantages and trade-offs. This move allows other participants to inject their own ideas about the “real” nature of the problem (naming), while offering possible critiques and downsides to others’ ideas (framing). Now, Kim isn’t noting a trade-off, but a disadvantage of the action of requiring background checks for gun purchases—the fact that a background check at the time of purchase doesn’t necessarily mean that the gun owner won’t develop mental health issues after the time of purchase or that the gun won’t fall into a mentally ill person’s hands. In response to the proposal of armed guards for elementary schools, Sean puts forth a clear trade-off in the middle of the conversation: “So we just have everyone walking around with guns all the time? We’d have people shooting each other even more often than we already do.” He’s certainly escalating the scope of the action James, a second amendment defender, proposed, from armed guards at schools to “everyone,” but he’s not saying that guards wouldn’t protect some people, just that it could also result in some other less defensible deaths. What’s interesting is how people discuss an inherent trade-off differently than they do a disadvantage. James: The problem isn’t the guns, it’s evil or sick people. Jane: But it’s not as simple as good and evil. Lots of people who aren’t mentally ill or what you would call “evil” shoot people, too. Kim: But I’m talking about mass shootings, like in malls or schools. Those are the acts of people with severe mental illness. James and Kim are both talking about the same problem—shocking acts of mass violence—and they believe the root problem is a person with a condition. Jane is talking about the incidence of violence at all levels throughout society, and to her the root problem is the violent act, which is made possible via a tool, a gun. This confusion about actors and root causes is one of the signals that lets us know that we’re overhearing people struggling with a wicked problem. Overall, this conversation appears to be thoughtful, respectful, and considers issues on a deeper level. Although many people have probably been having similar conversations in response to the Newtown tragedy, there are many polarizing conversations happening as well. How many times have we heard television pundits from the right and left arguing, or expert panels discussing the efficacy of different gun control laws in other countries? How many Facebook arguments have we seen, and how many times have we heard people hastily change the topic when they sense disagreement? How easily could this conversation have gone differently—but why didn’t it? Was it some combination of speech acts—the active listening, the validation of each other’s viewpoints before pushing back, the respectful questioning? Why did these people use these speech acts and not more adversarial or avoiding ones? And finally, will this conversation have any lasting impact on the judgments these four citizens will come to about gun control? How much? These are just the questions raised by this one anecdote. We’re interested in learning not only about individual conversations, but also about the implications for the public life that they add up to. Are there ways that this conversation could have been even more productive? Are there ways that it might have been completely shut down? How was this conversation influenced by previous ones each person had had before, and what from this conversation will each participant recall next time this issue comes up? How do all these tiny instances of deliberative naming, framing, and choice making add up—is it a question of critical mass or culture change? How do these conversations influence more traditional political behavior? What other results can be traced to this kind of talk? The two paragraphs above contain no fewer than 12 questions. As you can see, we’ve got our work cut out for us. So why are we asking these questions? Too often, deliberation is misunderstood as a specialized technique or method. By examining everyday speech acts, we can show that deliberation is a natural part of talk—a native plant, not some exotic flower you have to import and carefully nurture. If deliberation is a native plant that grows everywhere—perhaps it might only need a bit of water or soil amendment. If our research reveals communication practices that people already perform and use, then we can show people that the skills needed for deliberative decision making are already part of their everyday lives. We can also help people ask concrete, productive questions to figure out why their community is stuck on a problem and which skills they already have that can be used to help them get through it. Amy Lee is a program officer at the Kettering Foundation. She can be reached at alee@kettering.org. Erika Mason-Imbody is a research deputy with the Kettering Foundation and coordinator of the Coca-Cola First Generation Scholarship Program at The University of Alabama.